Okay, so listen. I know this soup isn’t going to win any beauty contests but you have to trust me when I say that it tastes WAY better than it looks. And the ingredient list is crazy short which is always a plus, right? The idea for this recipe came from the intense lemon craving I’ve been having over the last couple of months. I’ve been using them for salad dressing, avocado toast, cookies, you name it. It’s like my body knows they’re in season and wants me to eat them with everything. Especially soup, because it’s freaking cold. You know what else in season? Dark leafy greens! My favorite to way to cook leafy greens is sauteed with shallot in olive oil along with a touch of vegetable broth, lemon juice and crushed red pepper. Simple yet SO good. But rather than just have them as a side item, like I usually do, I decided to add some lentils to the mix and call it dinner. 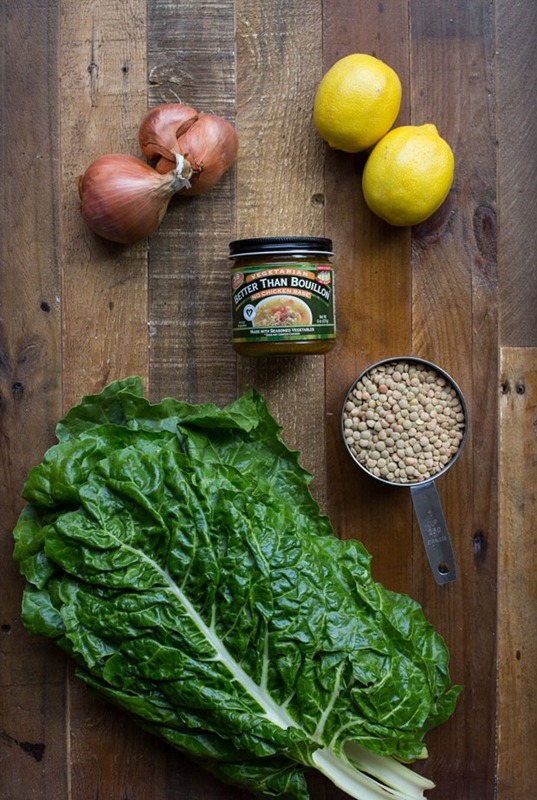 The end result is nourishing and hearty with a touch of lemony brightness. 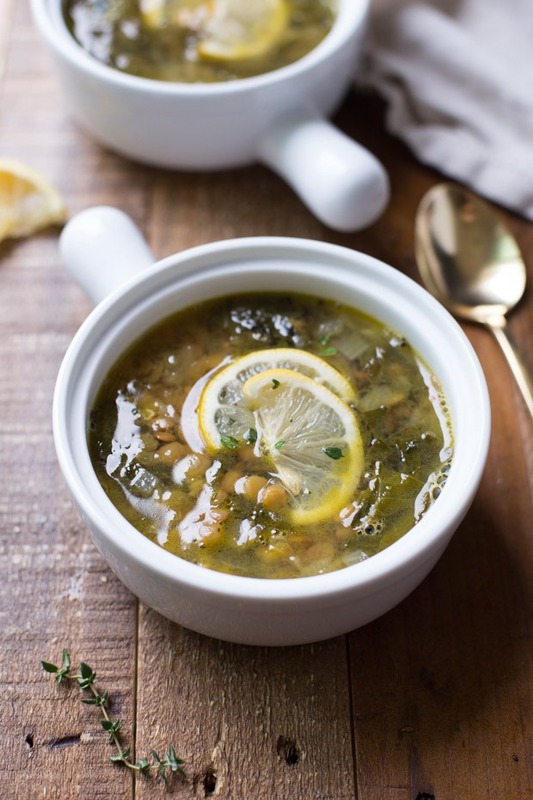 Plus, between the lentils, the greens and the lemon juice, it’s also a good source of protein, fiber, and vitamins A & C, making it the perfect plant-based meal to get you through a cold winter night. I hope you love it as much as we do! If you end up trying it, please let me know by leaving a comment below or sharing a picture on Instagram with the hashtag #makingthymeforhealth. It always brightens my day to hear from you! Start by warming the olive oil in a large pot over medium heat. Add the shallot, sprinkle with a pinch of sea salt and cook for 3-4 minutes. Next, add the chopped greens and crushed red pepper (if using) then stir together. Cook for another 2-3 minutes, until the greens are slightly soft. Add the lentils to the pot along with the vegan chicken broth and water then turn heat to medium-high and bring to a boil. Cook for 30 minutes, or until lentils are tender, then turn heat to low. Squeeze the juice of two lemons into the pot and stir together. Ladle into separate bowls, serve warm and enjoy! Did you try this recipe? Please let me know how it turned out by rating the recipe, leaving a comment below or sharing a picture on Instagram with the hashtag #makingthymeforhealth. I love hearing your feedback! Goodness, this looks and sounds delicious. 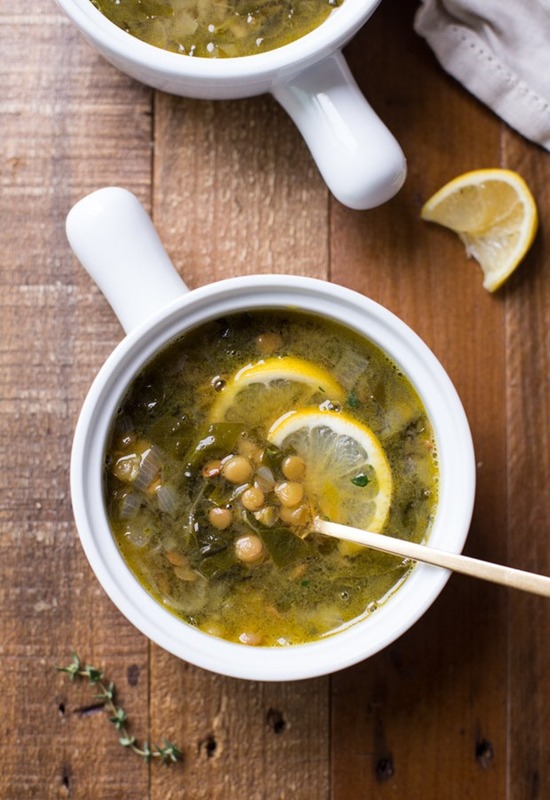 I have a cough and am a bit under the weather so this broth-y soup with it’s tart lemon and the goodness of greens and lentils seems just the thing to appeal. Handy that I happen to have all the ingredients. This is what I shall be eating tonight. Many thanks! Thanks Sara! I hope you love it and that it helps you feel better soon! 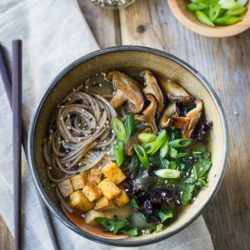 This is such a healing tummy soup!! Love the lemon! 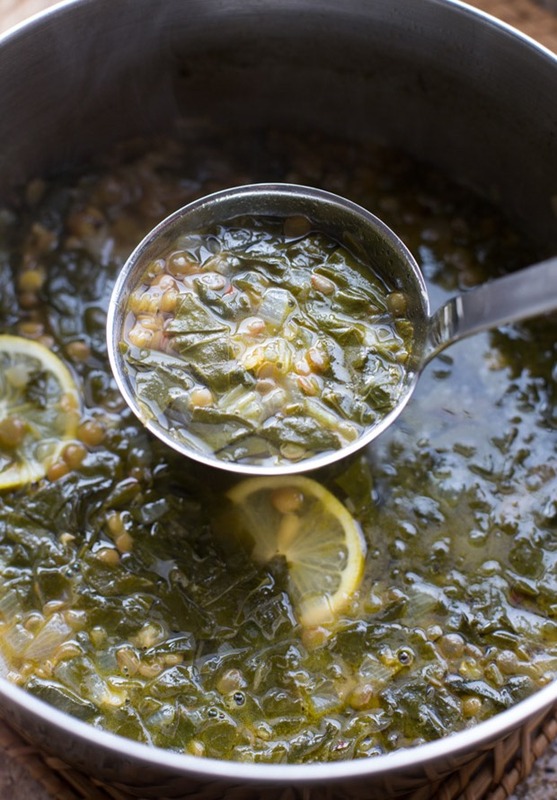 Lemon and lentils are always good together! 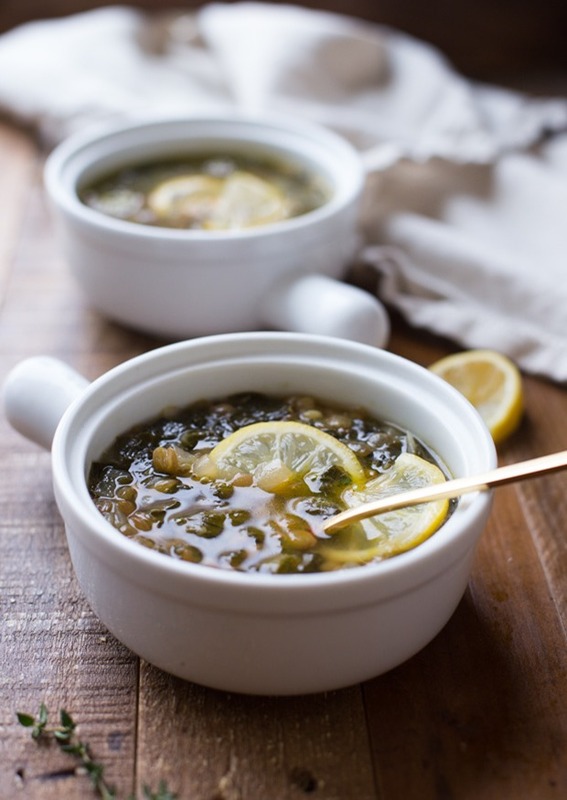 Seriously LOVE the idea of adding lemon to soup! I never would have thought of it. 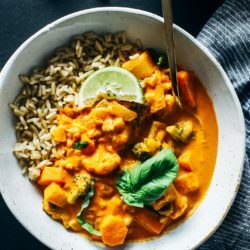 And the dose of vitamin C will help with iron absorption from the lentils and greens too ;) Also, I know how tricky it can be to make things like soups, curries, etc. look good, but I think you made this look delicious! 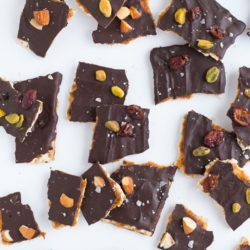 This recipe is actually so perfect, because I’m going home Sunday and trying to avoid grocery shopping before then and just living on things in my pantry. Pretty sure some of the main things I have are lentils, kale, and lots of lemon. Yay!!! The lemon craving is real! I go through them like crazy and am planning to plant a lemon tree in a few months. They grow really well in the dessert. I agree! A little lemon in desserts is like magic! Hey, don’t insult the soup- it’s gorgeous! 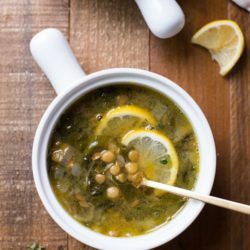 I had a similar lemony soup at a Greek restaurant once for my birthday and I haven’t stopped thinking about it since- totally got to make this :) Pinning! Oh yum! I’m obsessed with lemons. I feel like everyone in my office is getting sick, so I’ve been downing citrus like crazy and banning people to the doorway so I don’t catch it too. I will be making this! Lemons? Yes please! Soup? Yes please! And GREENS? Can I get an Amen? They are my favorite veg! Thanks for the recipe! I’m a big fan of squeezing fresh lemon juice on things too, especially avo toast and salad dressing….and lentils are always a winner in my book. I’m all about healthy, easy soups, and this looks like just like that! Very good soup. I love anything lemony too, and this really filled the bill. One of the things that I like about using lemon is that it helps me curb my salt habit. If you make something lemony enough, you need little or no salt. Thanks for a wonderful recipe! I made this soup last night. So so good! Highly recommend it for a healthy and nutritious meal. I added carrots and celery and used kale for my greens. Turned out great! I used my Palouse Brand Brown Lentils, too, and it was amazing! I only found about them (Palouse Brand) about a month ago. This soup is the 2nd lentil dish I’ve made and it’s amazing. It’s very hearty and filling. I have been using 2 cups of baby spinach instead of the swiss chard and we really enjoy this. The lemon makes the soup! Love this soup!!!!! Just made it – can’t get enough. This is my new favorite !!! Hello :) I’ve been looking for that no chicken base but there isn’t any in my area and I can’t seem to find a reasonably priced option online. Where do you get yours, please? Wow this hits so many different parts of my palate! ;-) There’s nothing better than nourishing, comfort food. Thank you for this. Can’t wait to give it a whirl. Thanks Shaz! I hope you love it! This was so simple and delicious. I used onion instead of shallot and a bag of frozen chopped kale to keep it easy. It only took 20 min, not 30, until my lentils were done. I thought one lemon was enough so stopped there. So so good and healthy and easy. I plan to make this a weekday staple! This looks amazing. I’m going to try using vegetable broth instead of the no chicken base. Thoughts? This is one of my favorite and easiest soup recipes ever!! It’s so tasty and comforting, and so easy to add any extra veggies too. Thank you for sharing, I’ll tell friends about it all the time! Love it. Added fresh coriander at the end with the lemon juice. It’s the dead of summer here in Northwest Arkansas but I still made this soup. It’s so satisfying and delicious, and citrusy. I’m so glad I stumbled upon your site whilst perusing Pinterest for lentil soup. Hi Cathy! The recipe makes enough for 4 bowls and will keep for about 4 days in the refrigerator. I haven’t tried freezing it but I think that would work just fine. You can always half the recipe to make 2 bowls as well! Cathy, I just pulled some from the freezer that I made back in July. I didn’t even bother defrosting it…I let it defrost while simmering. It was delicious! I added an extra squeeze of lemon to finish it. I made this once so far and am going to make it again tonight. 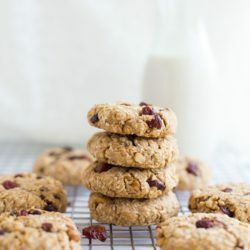 I cannot believe how delicious it is with just simple ingredients! I did use veggie broth instead bc it was what i had on hand but it still tasted great. Thanks for posting! This is a great recipe for chilly weeknights: super easy and my son loved it. 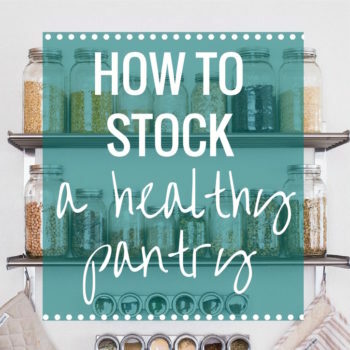 You can make it even easier by using precooked lentils and boxed broth (Trader Joes). I will definitely make this again. 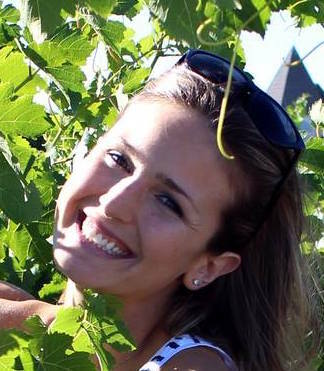 So glad you enjoy it, Julia! Delicious! I only used one lemon, and it was plenty. I also added 1/2 tsp salt, which was perfect. I was tempted to up the red pepper flakes, but did not, and that was a good decision. I definitely would use the 1/4 tsp, though – perfect touch to elevate this soup to something special. Quick and easy, freezes well. Any greens work (I have made it several times by now!). Thanks for sharing the recipe! Thanks, Sarah, for this AWESOME recipe!!! I’ve never written a review for a food blog before, but this easy, delicious and nutritious soup is inspiring. I’ve made it many times now with whatever greens I’ve had on hand and I’m always pleased with the result. My favorite was with escarole, but kale and chard are yummy too. Yesterday I used chard and cilantro and topped with grated parmesan and can’t wait to enjoy it again for lunch. Going to try your lentil loaf and tom kaa next. Keep up the great work! My review should show five stars but looks like four and a half. Would give it ten if I could! Aw thanks so much, Janice! I’m so happy you enjoy it. Thank you for the review! Delicious! 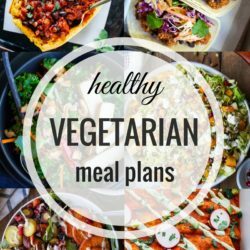 I wanted something simple and healthful and found this. I had to adapt it a fair amount based upon what I had in the house: frozen chopped kale, onions instead of shallots, vegetable broth as I’m out of the No Chicken base…but even with all my tweaks it’s still delightful. The lemon in it just sings. Thank you for the lovely recipe. I’m glad to hear it worked out well for you, Amanda! So, so good! Love the bright, clean flavor profile. We doubled this and added baby potatoes as recommended by another. Also added a head of garlic (for the double batch). Yum!!! So good! I had leftovers tonight.